When it comes to trees, we are the champions! Bodnant Garden is home to some fine Champion Trees – trees introduced many years ago from all over the world which are now some of the best of their kind to be found in the UK. It takes something special to be included in the Tree Register of the British Isles, which maintains a database of more than 190,000 Champion Trees dating back centuries. All are exceptional examples of their species because of their enormous size, great age, rarity or historical significance. Our student gardener Richard Marriot has been researching and cataloguing Bodnant Garden’s ‘champs’ and they tell a fascinating tale not just about the garden but of global horticultural discovery. The history of Bodnant Garden’s trees goes back to the 1700s when the land around the original house was landscaped. Around this time native species such as oak and beech were planted in The Old Park, now a wildflower meadow, which can be seen there today. 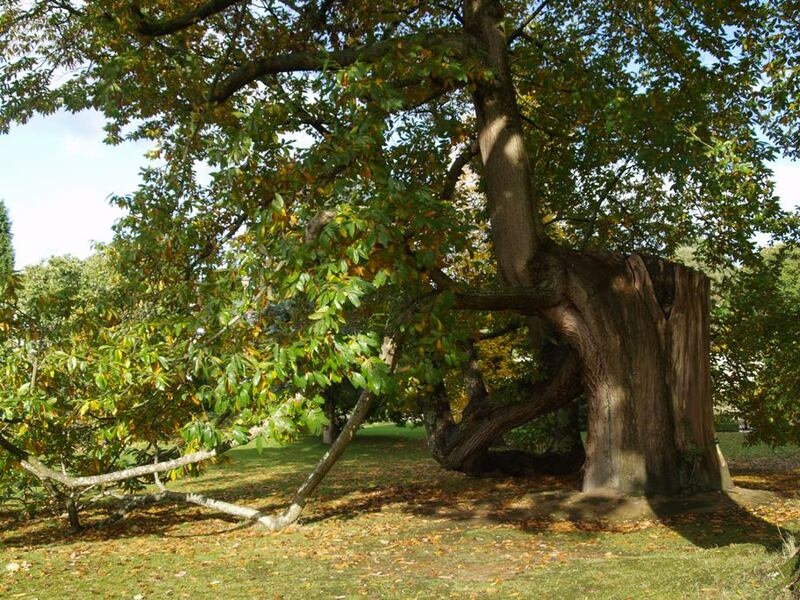 We think this is also when the massive Sweet Chestnut (Castanea sativa) on the Top Lawn was planted, now much loved by visitors because of its twisted trunk…the main stem was blown out at some point in the past and several larger branches have layered themselves on the lawn. The Sweet Chestnut is considered an ‘honourary’ native, having been introduced by the Romans. But the story of our Champion Trees really started when the house and estate was bought by entrepreneur Henry Pochin in the 1870s. 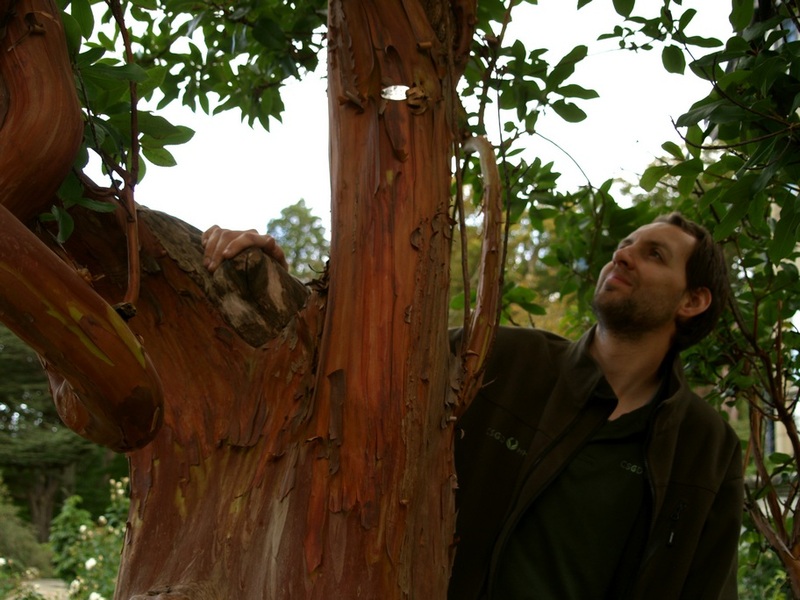 Pochin and his descendents were inspired by the plant hunting expeditions of the Victorian and Edwardian period and introduced many newly-discovered trees from all over the world to North Wales. It was Pochin who created the Pinetum in the Dell, planting the giant American and Asian conifers; the redwoods, cypress and firs (like the Douglas Fir, named after the ill fated David Douglas who scaled mountains and battled Indians, bears and disease in his North American quest for new plants during the 1830s, only to die from being gored by a bull in Hawaii.) 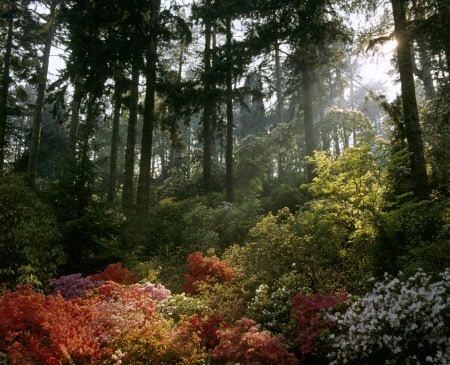 In the early 1900s the garden became home to more broad-leaved exotics brought back from Asia by by other famous plant hunters such as Ernest ‘Chinese Wilson’ and George Forrest, who endured their own hair-raising, life-threatening expeditions. 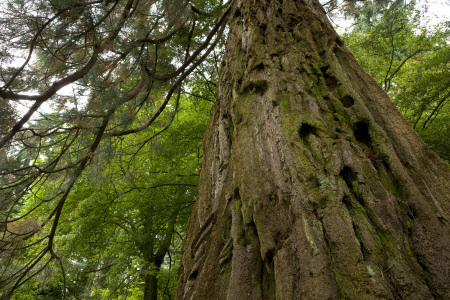 Sequoia sempervirens – This Californian Redwood is the tallest in Britain, at 49m. 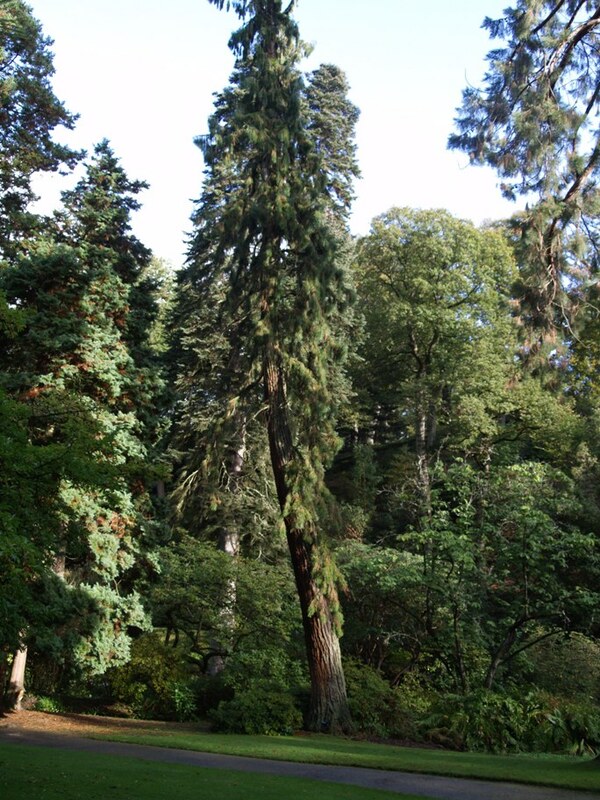 Planted in 1886 and among Bodnant Garden’s tallest trees, this example almost perfectly mimics wild specimens by being sited within a deep gorge next to a fast flowing river. Cedrus atlantica ‘Glauca’ – Arching silvery-blue stems make this arguably the most spectacular of all ‘blue‘ conifers and at 39m this specimen is the tallest in Britain. In common with so many trees in the Dell, this tree has been forced upwards in order to search out the light. Chamaecyparis pisifera ‘Squarrosa’ – Differing from the species form in that it has softer blue foliage, this contrasts with the bright rusted bark. 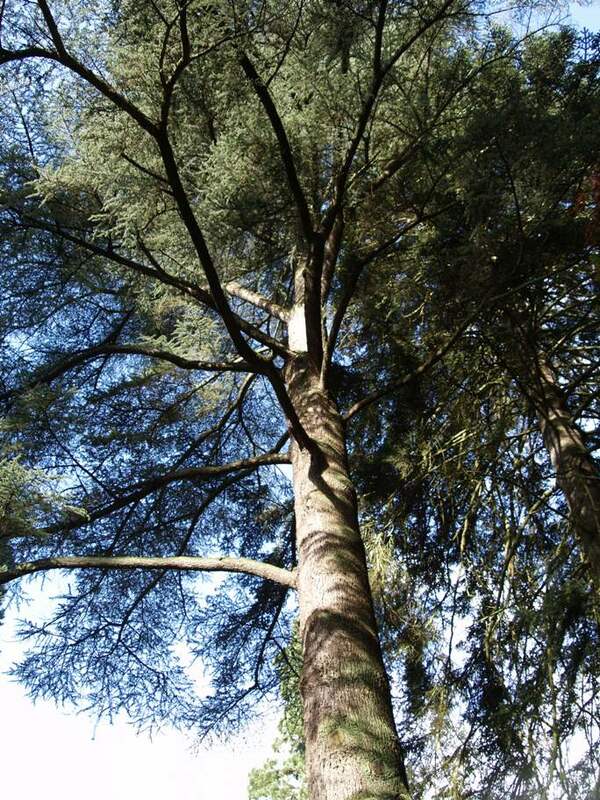 A Native of Japan, this is the tallest specimen in the UK at 25m, having been planted in 1890. 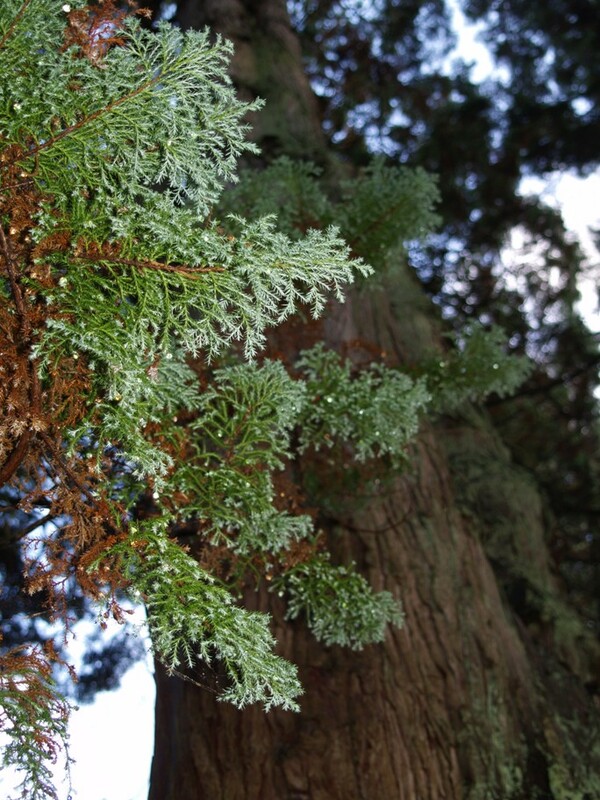 Sequoiadendron giganteum ‘Pendulum’ – An unusual Champion Tree given that this cultivar rarely attains much height, preferring to grow at a corkscrewed slant. Displaying a much narrower main stem than the species, stiff pendulous side branches hang down from this attractive specimen. Planted in 1890, this is the tallest of its form at 34m and has the largest girth at 298cm. Acer palmatum ‘Hagoromo’ – Quite a rare acer, the tallest in the UK at 12m and with the largest girth at 180cm. Typically quite a small tree, this acer exhibits short stalked, deeply cut leaves which colour an attractive scarlet come the autumn. Meliosma beaniana – A rarity in UK gardens, this species is almost unknown outside a few very select gardens. 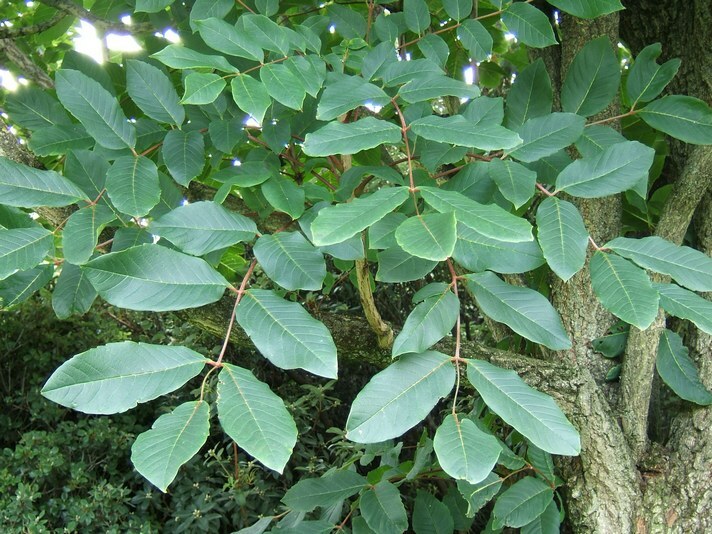 Handsome ash-like leaves are produced during the summer months folowed by fragrant white flowers in large panicles. Native to China and Korea, this species was introduced by the plant hunter Ernest Wilson in 1900. Bodnant Garden’s example is the tallest at 19.5m and has the largest girth at 169cm. 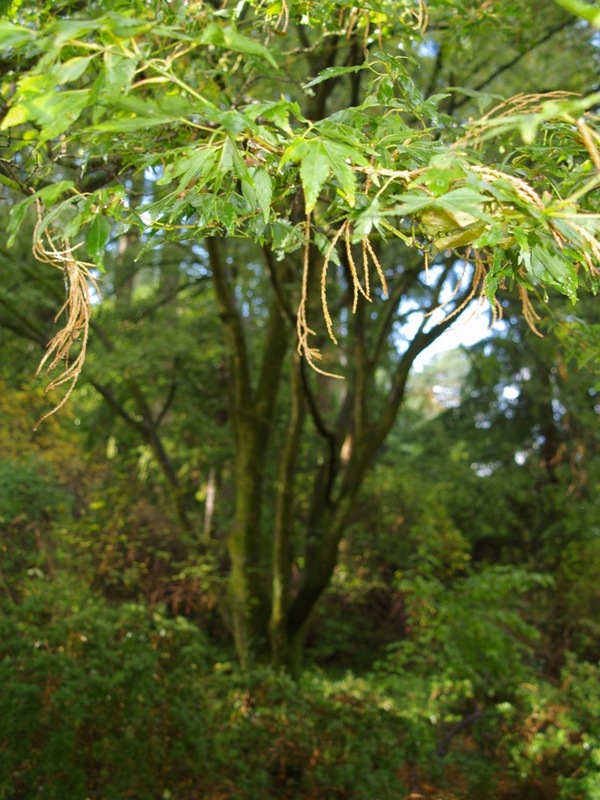 Acer truncatum – Situated in Chapel Park, this tree is characterised by its many lobed bright green leaves leaves which are heart shaped at the base. This particular tree is the largest by girth in Britain at 219cm. 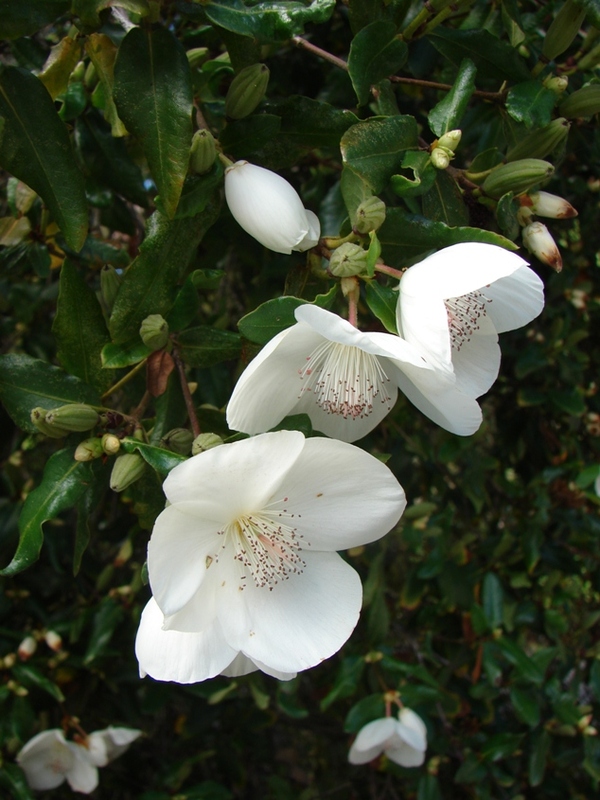 Eucryphia x intermedia ‘Rostrevor’ with the largest girth at 128cm, this cultivar found on the Magnolia Walk displays fragrant white flowers which smother the slender stems in August. In all there are currently throught to be 16 Champion Trees around the garden, along with many others which are magnificent in their own right and all have tall tales to tell: The massive cedars on the Lily Terrace, planted in the 1870s, around which the terraces were later built so as not to disturb the trees; the towering Magnolia campbellii brought back as seed from from Asia in the early 1900s by Forrest, grown against the shelter of the terrace walls because it was not known how hardy they were; the Handkerchief Tree in the Shrub Borders grown from seed collected by Wilson on one of his trips to China; and the Embothrium (Chilean Fire Bush) and Eucryphia brought back from South America by Harold Comber, of which we now hold National Collections of both. Richard’s full list of Bodnant Garden’s Champion Trees will soon be on our website and we’re hoping to produce a printed garden guide too, so watch out for that. We also run special Champion Tree guided walks where you can find out more about these fascinating giants. 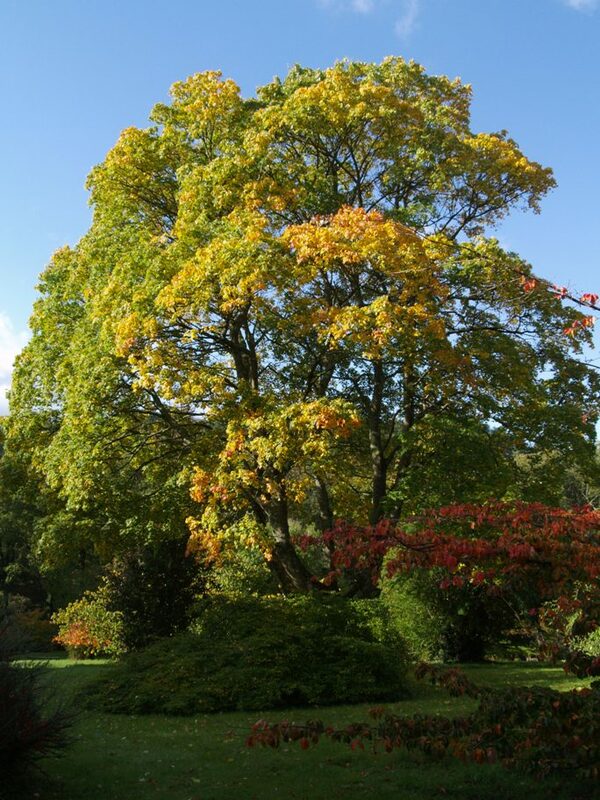 This entry was posted in Gardeners' Notes, Green Shoots: Student News and tagged Autumn colour, Bodnant Garden, Champion trees, Gardens in Wales, Plant hunters.